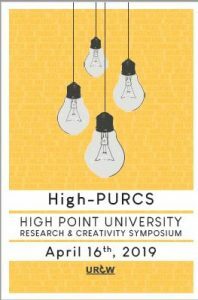 High Point University undergraduate students from all schools, majors, and minors are invited to participate in HPU’s 7th annual Research and Creativity Symposium (High-PURCS). This event will showcase student scholarship in a supportive environment that models a professional venue. Students may choose to present their work as a poster, oral presentation, brief performance, or exhibit. Projects must be mentored, independent work that reflect originality and creativity and be quality products that went beyond a course assignment. Each year the office of Undergraduate Research and Creative Works offers two $250 monetary awards at HIGH-PURCS. Click here to submit your work.